Since then, huge steps have been made towards equality. What I wonder is when someone is going to recognize that the mentally ill are being discriminated against, prejudices against them run wild and there is a huge problem with stigma.In many cases they’re not allowed the same freedoms as “normal” people. Who is going to stand up and say that they feel that all people regardless of what illness they have, will be treated humanely and without stigma or discrimination? When are the voices of those who are advocates for the mentally ill and the people with mental illnesses be heard? The color of someone’s skin is no longer a reason for most people to judge or discriminate against them. However, people are constantly judging those with mental illnesses and the stigma lives on. We, the mentally ill, often blend in with society. It is not usually obvious that we are not different than anyone else. However, if all people who had a mental illness had to wear a purple dot on their cheek that let everyone know they had a mental illness, how many employers would hire them? Who would listen to what they had to say? Would doctors dismiss their medical problems as soon as they saw the purple dot? Would friends and family turn the other way? Would people run the other way so as not to deal with someone with a purple dot? The answer to these questions, in my opinion are yes. The stigma that people with mental illnesses have to endure is often unbearable. The discrimination is also awful. Most people would probably never admit that they would rather not be friends or related to someone with a mental illness, but it is pretty much the truth in many cases. People with purple dots are in a lot of ways like people with a different color of skin. We, those of us with these dots, can’t tell someone of their troubles without being judged, ridiculed, or forgotten about. It is not like having cancer or diabetes in the minds of most people. Although, mental illnesses are usually the cause of a chemical imbalance or a traumatic event. Instead of people looking at us with amazement that we have endured what we have, they would rather just not get involved or admit they even know us. It is sad. In fact, it is very sad. It is because of the stigma attached to these purple dots (mental illnesses) that people don’t get the help they need. It is because of the dots that people feel ashamed to tell anyone. That’s why someone needs to say, “I have a dream that some day people with mental illnesses will be viewed as people in the society equal to all others and that they get the same rights as any other person. I have a dream that stigma will no longer exist and my children, if they have a mental illness will never have to endure the pain, suffering, embarrassment, discrimination that so many people with mental illnesses do today. I have a dream where mentally ill patients get the care and medications they need, are treated humanely in psychiatric hospitals and are not fired due to their mental health problem. Our purple dots should not keep us from doing anything anyone else can do! This entry was posted in Uncategorized and tagged advocates, advocates for mentally ill, bipolar disorder, depression, disabilities, discrimination, mania, mental illness, mental illness awareness week, mentally ill, nelson mandela, petition2congress, PTSD, schizophrenia, stigma. Bookmark the permalink. 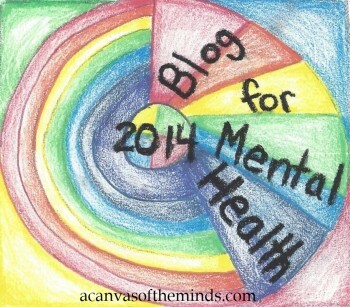 A great post on the importance of recognizing that people struggling with mental wellness are still people! Thank you for this article. Thought provoking and important. As one who works in the mental health field, I think this is the most important topic today!